Sandbridge, in the U.S. state of Virginia, is a coastal community of Virginia Beach, located along the coastline on the Currituck Banks Peninsula at the northern end of the Outer Banks. The Atlantic Ocean is to the east, the Back Bay of the Currituck Sound is to the west, and the Back Bay National Wildlife Refuge and False Cape State Park lie to the south. To the north, Sandbridge borders the U.S. Navy’s Dam Neck facility. Located near the southern end of Sandbridge is Little Island Park, which is managed by the City of Virginia Beach. Sandbridge Beach runs approximately 4.5 miles (7.2 kilometres) from north to south along the oceanfront. The only public road entrance to the community is Sandbridge Road, which is near the northern end of Sandbridge and connects it to businesses and neighborhoods in the Princess Annearea of Virginia Beach. Local residents used to have the privilege of driving through the adjacent Dam Neck Naval installation (with permit) to shorten their commute. A special guard was posted on the south entrance of the base to admit or deny travelers. However in the post-9/11 atmosphere the “back-gate” has been closed down for security purposes. A bicycle/pedestrian trail is planned through the Wildlife Refuge which would connect Sandbridge to its nearest neighbors in Lago Mar as well as the shopping and dining centers at Red Mill, Courthouse and beyond. Sandbridge is known for its somewhat remote location and receives a smaller volume of visitors than the main Virginia Beach resort strip located a few miles to its north. The Virginia Beach EMS Lifeguard Division does protect the water in Sandbridge. They hold four stands at Market Place Beach and ten stands at Little Island Beach. There are four supervising lifeguards who keep constant patrol over the rest of the waters where lifeguards are not permanently stationed. Lifeguards are on duty daily from 0930-1800 Memorial Day weekend to Labor Day. 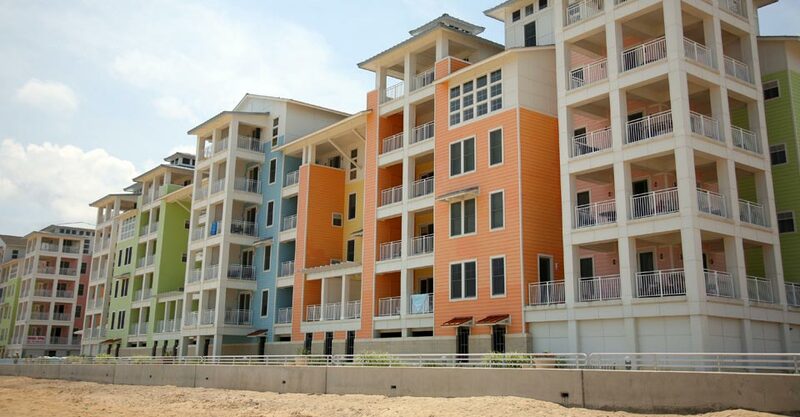 Sandbridge consists primarily of single family homes; there are also four condominium buildings. Many of the residential properties are available for rent on daily, weekly, or monthly basis. The ratio of year-round residents to renters is said to be about 1:5. Through the mid-1990s several homes were lost to the Atlantic, but sand replenishment efforts have been successful in restoring the beach. At one time it was not uncommon to see a Banker Horse which had roamed too far north. The horses were known to cause problems eating vegetation from yards, and occasionally were struck by vehicles. More fences were built south of the Virginia/North Carolina border to help curb this problem in recent years.